I don’t know about you, but I often find myself quite useless in the hours between 2-4pm. Now, don’t go tell anyone. It might destroy my credibility LOL! 😀 But it’s between these hours of the day that I find myself being a zombie, and operating almost on auto-pilot as my energy levels drop like a stone. So, where possible, I arrange my meetings for the mornings, when I’m much more alert, and keep the afternoons for more mundane things. Well, unless of course it necessitates me using the ol’ grey matter, when I’ll find some way to keep my eyes open and my brain cells functioning. But you know what? I’ve found one almost sure-fire way to beat this afternoon slump, and it’s not something you’d like to hear, but here it is. As much as I detest the notion, I’ve found that getting active actually makes me get over that zombie-state of being, and makes me function better. I think it is to do with the fact that when you force your body to move, it boosts your endorphins and that makes you feel better. Also, for some strange reason, it actually helps me feel more energetic, and I function better as a result. What I try to do therefore, is slip in a quick short walk/run on the treadmill, just enough to get the heart pumping. This seems to wake me up and once I’m done, I stay woken up. Other times, I do a short session of yoga. Although not strenuous like walking/running, the stretching and bending gets the blood flowing and makes you feel a little more alive as a result. If you work from home, Tine has shared a tip that incorporates short breaks for exercise and while I can’t say that I’d be able to keep to that, I like the idea of taking a break and slipping in a short exercise session. You will find that it helps you actually function better, and might even help reduce stress levels. But what if you don’t have the luxury of slipping off to the gym or rolling out your yoga mat? Goodness knows, sometimes, we’re trapped behind our desks, sleeping with our eyes open. Well, go for a walk then, or get out of your chair and do some quick in-situ stretching. You can try slipping away from your desk for about 10-15 minutes, and just get the blood flowing. Sometimes, I just take a walk around the building, or just get up and get moving. This is what I think is key to beating the mid-afternoon slump – moving, so you raise your heartbeat and get the blood flowing, instead of having it moving sluggishly through your body as you sit at your desk. Not eating heavy lunches help too, but I’ve also found that even if I eat a light lunch, I often get hit by that slump anyway. I think it’s just our body’s way of telling us to take a break. We’re not machines after all, and we can’t just function for over 6 hours at a stretch at full speed. As for coffee? Don’t even go there. I’m an insomniac so while coffee will jumpstart the slumbering engine, it keeps it running long after I should be in bed, and that’s another problem I don’t want to have! 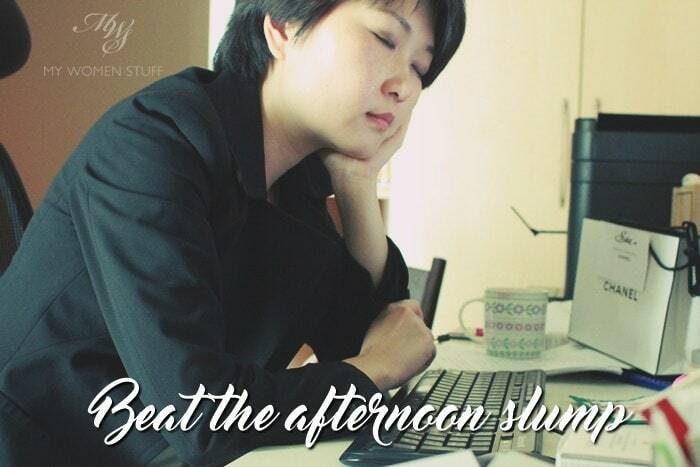 How do you deal with the afternoon slump? Have you tried incorporating exercise? NEXT POST: One shot of the REN Instant Firming Beauty Shot and instantly I’m in love! 2. I go for an extra long walk over lunch if the weather permits. 4-5km and I walk very very fast. It helps clear the head and the frustration built-up from the morning so I’m ready to face the afternoon. 3. Go for a drive. I’m lucky that I’m practically 30s from the freeway and going home during lunch takes me only 10-15mins max. I do that sometimes. I walk the furball, I get the dishwasher going, I can get the washing machine going, I can set the robot to vacuum again (clean floor nazi). Doing those mundane tasks help me reset my brain. Getting out of routine is definitely one good way to break the energy sapping loop. Also, I think warmth is more conducive for snoozing, and as you know, it’s hot here, so zzzzz…….. When I was working in an office, I used to drink a lot of water in the afternoons because that means it’ll force me to go to the toilet. Even though the loo isn’t far, I still had to walk up and down 2 flights of stairs and it’s a great way for me to get up, stretch, and walk. A splash of water on the face works well too! Hahahhaa Yes yes I do that too – drink lots of water. At least having to walk to the toilet gets me up and moving! 1. Eating sugary stuff at lunch or to try and get a perk-me-up when the eyelids want to follow gravity! I used to do that and the sugar would give me a quick peak and then … OMG…. lagi teruk! While I don’t do my exercise in the mornings, I do get my exercise a couples of times per week in the evenings . I find that does help with keeping me alert and refreshed overall. When my classes go on a break, my body immediately feels more lethargic throughout the day. Also, doing some deep breathing works for me as well. I think that as the stress pile up, we can end up having shallow breathing and that leads to kekurangan oxygen to the brains. So taking a few deep breaths can make a difference. I’m pretty sure different things work for different people though. Thanks for sharing your tips Isabel! You’re so right about sugary lunches and heat. In fact, my office used to get quite warm occasionally (like when the weather is horribly hot like it is now) and I find that I’d start feeling sleepy. Warmth is so conducive to sleeping isn’t it? A cold office often makes for more productivity I feel Haha! As for me, exercising makes me even more tired and sleepy 😀 :D. Usually after my morning run I need to take a nap. It has become a bad habit that I’m trying not to nap after my run. So straight to the computer to work. I’m working from home too and I have been quite discipline with my work schedule. However since Sephora is like 10 mins away from me, I tend to sneak out to the mall for a coffee and a quick window shopping lol. Hahaha Trust me, when the afternoon slump hits, Chanel or no Chanel I wanna just zzzzz…. I remember you told me you’d be up and out by 5.30am which I salute you for. That’s about the time that I’m in deepest sleep, I think! I think the warmer weather now isn’t helping, coz I’d get tired in the afternoons regardless. Doesn’t help when the air-conditioning isn’t cold enough to keep you awake! I sleep during lunch. 😛 I pack, like I think you do, and after I finish eating in 10 minutes I usually doze for 15-20 minutes.